The Benetton B194 was designed by Rory Byrne for the 1994 Formula One season. The car was closely based on the previous Benetton B192/3 and powered by a Ford Zetec-R V8 engine (produced by Cosworth but badged as a Ford). The electronic driver aids that had had such an effect on F1 over the previous seasons were banned, so the car had to be redesigned with the new rules in mind. The B194 was a light and nimble car that handled well and was most competitive in the hands of Schumacher on twisty tracks unlike the early Williams FW16 which proved difficult to drive thanks to Williams' dependence on electronic driving aids in the previous season. Michael Schumacher's B194 remained the most competitive driver/car combination until Williams introduced a B-spec car at the German Grand Prix. The car was very competitive in the hands of Michael Schumacher, for whom the B194 was specifically designed to suit his driving style. Schumacher won six of the first seven races of the season after his main rival, Ayrton Senna was killed at the San Marino Grand Prix. Other teams suspected the B194 was not legal, due to the high competitiveness of such a comparatively underpowered car. The FIA launched an investigation and a start sequence (launch control) system was discovered in the cars' onboard computer systems but no traction control. In the end, the governing body could not prove the systems had been used so the complaints were dropped. Schumacher himself was subject to controversy, after being disqualified from the British Grand Prix and then the Belgian Grand Prix which allowed Damon Hill to cut into the German's points lead and as they came to the final race in Australia, Hill and Schumacher were separated by one point. Schumacher commented years later that the B194 was actually quite a handful to drive, being twitchy at the rear end. Schumacher had three team-mates—JJ Lehto, Jos Verstappen and Johnny Herbert—during the course of the season. All found the B194 difficult to drive; Verstappen said in 1996 that "I must have a little the same driving style as Johnny because he said basically the same things about that car that I did and seems to have had the same feelings. It was a very difficult car. You could not feel the limit and so you were pushing and pushing and then suddenly it would have oversteer. Normally when you get oversteer you can control it but the Benetton would go very suddenly and so you ended up having a spin. I had big problems with that car." A contentious collision between the two drivers ended the 1994 drivers' title in Schumacher's favour, and the B194 was retired at the end of the season with eight wins and second place in the constructors' championship. 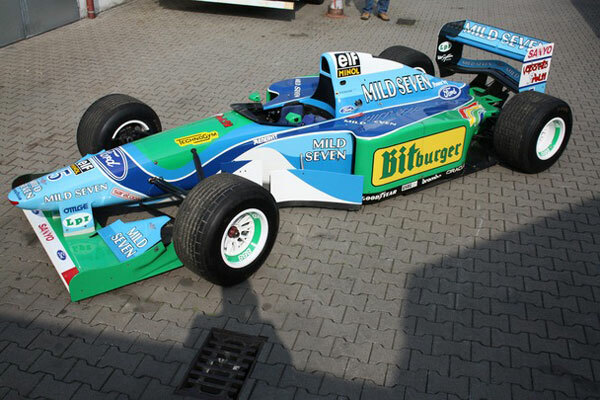 The car was replaced by the Benetton B195 for 1995.